Late 2005 and all of 2006 were extremely dry and as a result Lake Lavon had fallen 16 feet below conservation pool level forcing a level 3 drought for most of North Texas. You see Lake Lavon is the source for much of our water. In a rather interesting turn of events, this January is one of the wettest on record. That made me interested to see how the recent rains effected the water levels in the lake. On January 1 of 2007 the lake was 16 feet down. Today the lake is 8 feet down (and its still rising.) I find it amazing that the lake has risen by 8 feet in 28 days. And let me add, this is a BIG lake. Next I began wondering what the lake level was a year ago. So I looked it up and the Lake was 8 feet down a year ago - exactly like it is today. In other words the January rains have made up for the whole last year of the drought! Now that's a good thing. After three weeks of increasing running mileage, and thinking ahead to hill workouts, I decided it was time to do some circuits. So on Monday after work I high tailed it down to SMU to make an appearance with Coach Vaughan. Getting down to SMU from the office was murder, but I was able to get there and get in some circuits. On Wednesday, I hooked up with Karl, a bit closer to the office and we did circuits on our own. Friday and Sunday I put in some long runs. Tuesday I hooked up with Victoria and Bob for one of our brutal swim workouts. Gerald, who joined us for part of the previous Thursdays workout was there too. Gerald brought Victoria her awards from the USAT Southwest regional. Wouldn't you know it she was named Elite for 2007 in both the Tri and Du. Thursday Victoria killed me with the 100 meter spiral of death. Basically 10x100 starting off with the first two at 2:00 and then dropping by five seconds every second one. Somehow I survived that. Saturday I got up late but I still hauled the bike over to Sachse where I picked up the fast RBM group for the ride back to Bike Mart. Then I proceeded down Meandering Way to the El Bee Jay Freeway. 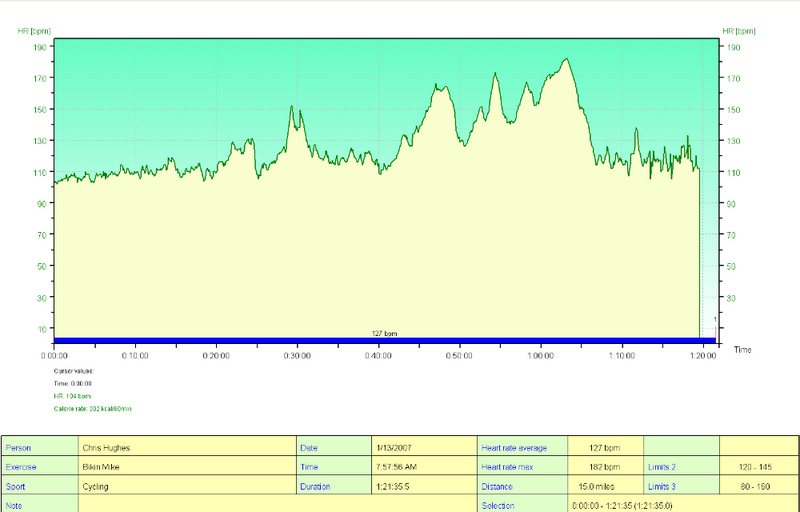 I tagged up there and headed home for 37 miles at 18.2 pace - a nice ride with a bunch of tempo. This was my third solid week in a row. In fact, I have done 26 days in a row of at least 60 minutes of effort. I have also been eating better. As a result I have lost 5 pounds! First let me say, that I really felt like I needed to kick up the workouts in January. And so far its working well. I have done at least 60 minutes of something (running, swimming or biking) every day for the last two weeks! And I have worked out every day since Jan 3. Its a good streak for sure. Monday: 60 minutes Lifecycle - 20.6 miles. Saturday: Bikin Mike - 30 miles, 2 hours. Well if you call the artificial turf at the Inwood Soccer Center a Field that is. Unlike last weekend, we only had two games. Logan's team at 3 and Marissa's team at 6. That still meant hanging around for a while between games - but that's life on the pitch I suppose. Logan played Forward, Mid and Backfield during the first half of her game. She played well and her team was tied 1-1 at the break. Logan was sent in to play keeper in the second half. She made a bunch of great saves, and was also punting the heck out of the ball. In fact, on one play she booted the ball all the way down field to her Forward who popped it in for a goal. Her team scored three and she gave up no goals. So she came away with a shutout and and assist. She also got a compliment on her keeper play from Coach Stephen. Marissa came out strong in her game at Forward. Later Joe put her in at Mid but she must have been gassed because she was trotting rather than running. Toward the end of the second half Joe sent in Marissa to play forward across from Katie - who is our regular keeper - but she was also playing forward. They brought the ball in and Marissa pushed it to Katie who scored. Then a few plays later Katie returned the favor and Marissa got her second goal of the season. Marissa was ecstatic to come away with a goal and an assist. It was a good day on the pitch for the Hughes Girls. It rained all week and it was still raining this morning. Terry was out of town. So it seemed like a good idea to head back to Bikin Mike's spin class. Last week I did the 8:00am class and then I high tailed it outta there to get to Reagan's soccer game. Today, I had no soccer requirement, so I figured that if I could survive the 0800 class, I might stick around for the 0930 class too. This time I set up the bike on the next to the lowest setting, as I didn't want to kill myself nor did I want Mike coming over and jacking with it during the ride. The first session was climbing, and while I kept my HR in Zone, I had a gallon of sweat on the mat under the bike. The second class was running, and while I continued to have the sweat pour off of me, I was also able to keep my HR in zone. Recycled Wyeast 1007 German Ale Yeast captured from Secondary fermentation of the Dec 28 batch. Usually, I put the hops in a hop bag. Today I just tossed them in the brew kettle. That was messy and also resulted in less yield. I'll probably dry hop this batch, like I did the last one, but I am out of Saaz hops so I'll use some Fuggles plugs I have sitting around here somewhere. Update Feb 4 - Specific Gravity now 1.012 (5.5% alcohol) time to bottle. OK I couldn't stand it so here is the secret decoder from page 104. So I gotta Tag three Bloggers: Mal, Julia, and Jeff. I was much more worried about today's workout with Bob and Victoria than I was about my visit to Bikin Mike. Apparently with good reason. I got to the pool a bit earlier than the 1130 appointed hour. I figured that was good for me for a longer warmup. I had 700 under my belt by the time Bob turned up and added another 150 by the time Victoria arrived. That's when all hell broke loose. Victoria proclaimed that we would do 3x(300 in five minutes, 2x150 in 2:30 each). I think I hit the first mark but none of the others. Regardless of what the clock said, I decided that I would take 20 seconds of rest. And we took a full minute between sets. My HR after the first set was 180 (90% Max), Second set 190 (95%) and the third set 200 (100%). Sheesh! Then Victoria and Bob did 4x50 breast. Except Bob did Back. Victoria told me to rest for their first 50. I am not a big breaststroke fan. But I obliged and did my first 50 breast stroke in 25 years. Sheesh. Then I joined Bob in the Backstroke, but I switch back to Breast stroke for the last 50. After we were done I discovered a few important facts. 1) Bob swam for Michigan State. 2) Victoria swam for UConn. Chris swam for no one since he was 13. I am still not sure I have gotten myself into this group. Since the kids don't have school tomorrow due to MLK day, I thought I'd ask them, "Who is Martin Luther King?" Logan - "He's the guy that gave us world peace." Wow. Logan needs to get caught up on current events. Marissa - "He's the guy who ended slavery and got shot." hmmmm. That's probably a better answer than Logan, but still needs improvement. Logan went on to point out to Marissa that it was Lincoln who freed the slaves. So there is some hope for Logan. Reagan - "I don't remember." There is an honest answer! I can see I will need to work on civics with the children. Sheesh! After my adventure with Bikin Mike, I had to hightail it over to the Inwood Soccer Center as each of the girls had a game to play Saturday. The bad part was that Reagan was scheduled for 10:30, Logan for 2:15 and Marissa for 5:15. And that meant that there was not really enough time between games to come home, but there was too much time to hang around Inwood all day. I arrived at Inwood just before 10:00am. The Superblue 2000 'A' team was on the field. Immediately one of the parents began shouting at me, "Hey we only have five players. Send Reagan out." Well since I did not have Reagan that really confused me. And even more so, because when I looked on the field. There was Reagan. Reagan plays for the 'B' team. But she played last season with all of these same girls and they all practice together. The other team had a full side of 7 players plus some subs. In spite of that, the five 'A' team players and Reagan beat Cosmo 5-4. So Reagan played that whole game, and then she had to come back and play the next game with her team, the 'B' team. Two of the 'A' teamers stuck around so the 'B' team was able to play a full side of 7 players plus two or three subs. For the first 10 minutes of the second half Reagan played keeper and did not let any balls through - another shutout! In the process the 'B' team won their first game of the season, beating the Puma's 9-0. Throughout both of these games Reagan played really great soccer. I was very proud of her efforts. We then loaded everyone up and headed to IHOP for some late breakfast and did some goofing around before heading back to Inwood for Logan's game. With just ten minutes or so before Logan's game was to start we only had three players! And with just seconds to spare four more turned up giving her team a full side but no subs. They were playing FC Dallas, who had plenty of players on the bench. For the first half Logan played right side forward with April on the left and Savannah in middle. These girls play amazing soccer for their age. They played a triangle for most of the first half pressing the FC Dallas Defense. The two teams traded goals such that it was 2-2 at the half. Logan played her heart out and had at least ten shots on goal in her effort. But I could also tell that she was spent at the half. Not surprisingly Logan played keeper the second half. The teams traded two more goals each to get to 4-4. At that point the war of attrition began. It was obvious that our girls were out of juice without being able to take any rest. They gave up two goals and were down 6-4. With three minutes to go, they got one of those goals back, but were unable to get another goal in losing 5-6. That was a real shame because they played so well. They are an amazing team, and yet they have no wins this year - which is very surprising. After Logan's game we killed some time up at my office, then returned for match number four. Marissa's team was playing Sting Black 96. This Sting team is a year younger than Marissa's team and they play in the Plano League which means that this was team that Marissa's team should beat. Form followed function with the Texans racking up a 5-2 win. Marissa played a great game taking several shots, racking up one assist and performing a step-over skill while moving the ball up field. I was truly impressed with the effort that all three girls showed. Reagan really amazed me playing two games back to back including staying on the field of one of those games. Logan played her best half of soccer ever at forward. And Marissa played great soccer with the assist and the skill move, and also, taking out the keeper at one point. As I have previously mentioned it is raining weekend here in Dallas. Terry told me that he was gonna do a spin class with Bikin Mike on Saturday morning to beat the rain. I figured what the heck - its not like I had anything better to do - so I joined him. Terry was the only one in the parking lot when I arrived around 0720 or so. A couple of other cars pulled in and around 0730 Bikin Mike turned up and opened up the studio. Terry and I grabbed our bikes and other assorted gear and hauled it into the studio. Terry helped me set up my bike on the trainer. Of course I had some weird non-standard skewer, so I had to undo that and replace it with one from the Bikin Mike Skewer Bucket. 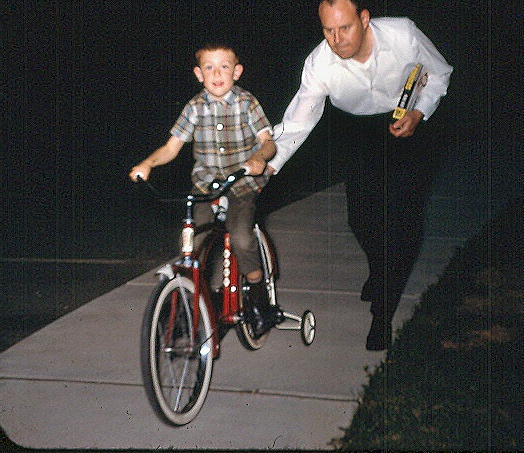 After filling out all the essential paper work, I climbed on the bike and began to spin. At 0800 Mike climbed on his bike and cranked up the tunes. I expect Mike is about as old as I am. He was playing a buncha tunes mostly from the 70's and 80's while barking out the tempo (Cadence) and load (big chainrang front, heavy load in back). It was just like sweating with the oldies. Terry had set my trainer with a fairly light load and so for the first 30 minutes my HR hardly climbed above 130. I was thinking about loading that thing up. Well it was like Bikin Mike read my mind - because he jumped off his bike, then checked on some girl, then he walked over to me as asked if I needed more load. I said yes, and then all hell broke loose because he cranked that damn thing all the way to the freaking max. Now the weird thing is that during the whole class I was the only person that he did that to. Weird. So the second half of the class, I was dying to keep up. My HR was pushing 180! Overall it was an excellent hour-plus of work. Here is the HR profile. Guess when Mike dialed up the load! Its been a long time since I could report on a long wet run due mostly to two important facts. First, North Texas is in the middle of a huge drought so its not like we have much rain to run in! And second, because I have not done much running due to the knee and SI issues. Both of these dynamics appear to have taken a turn for the better. It rained Friday, all day Saturday and it's supposed to keep raining today. Logan got me up around 8am this morning and the ground was dry! So after getting Logan squared away I figured I'd sneak in a quick run before it started to rain again. But by the time I got dressed, it was too late. The rain was coming down. However, I was committed. So out I went. This was to be my fourth run of the week. Now I don't think I've done that in a long, long time. I headed out for my my old 60 minute run through Breckinridge park. I had deprecated that run in favor of one big loop using Park Vista and the new bridge that they built on the west side of the park. But Park Vista is a dirt road and it would have been way to muddy. So it was really cool to do the old run. Attached is the Doppler radar animation for the run. I started right around 9 and ended just after 10. If you find the point halfway between the 'o' in Plano and the 'w' in Wylie, then drop south to county line - thats where I was running. You can see the big red blob move in just as I was finishing. That was fun! The Terps are doing well with 15 wins and three defeats, but they had dropped their first two ACC games against BC and Miami (Why did we ever let those Big East Teams in the ACC??) Anyway, BC has a pretty good team, but losing to Miami at the Comcast Center was ridiculous. Anyway things looked pretty bleak for the Terps heading into yesterday's match up with the only unbeaten team in the NCAA - Clemson. Even worst because Maryland had lost the LAST FOUR games that they have played against the tigers. Thankfully the Miami loss appeared to be the wakeup call for this team and they pulled out the win! It will be interesting to see if the AP poll will finally give the Terps some respect. That said, Maryland has four of their next five games on the road in the ACC including at the Hokies, at the Deacons and hosting Georgia Tech. That's a tough lineup. Meanwhile the Catamounts had a six game win streak working as they headed for a showdown with Albany at the Patrick Gym (Home). The Great Danes won the America East last year and were picked to win again this year. However the Cats were 3-0 in conference with two road wins (New Hampster and UMBC), heading into the game. The Danes had already dropped one game in conference and surely could not afford to lose to the Cats. Vermont ralled from a half time deficit to win the game, putting them at 12-5 overall and 4-0 in the America East, the only team without a loss in the conference and also the best overall record in the conference. Go Cats! After a couple of runs on the treadmill I decided to give the roads a try. Monday I did a 45 minute loop from the house down Park Vista and through Breckinridge. Yesterday I tried my long route from the gym. I was able to knock out that 7 miler in 60 minutes with no problems! I have been wearing a knee brace, but I am not sure I need it. I will try some runs without to be sure. At any rate it appears that I can run! This is excellent. Tuesday, I hit the pool for a 3000 meter workout in 60 minutes. I did a 5x100 warmup, 2x500, 1000, and 5x100 hard. That was really nice. I had previously met a couple of folks who swim usually around the same time as me, Bob and Victoria. Bob is a swimmer. Bob told me that Victoria is really crazy, that she even does triathlon! Heh, heh. My kinda gal. Anyway, Bob is several inches taller than me, and has these long arms and huge shoulders. He has this nice slow stroke which he uses to lap me with high frequency. Sometimes I can keep pace with Victoria. So today I was at the pool early before those two turned up. Usually they are there before me and are gone before I am done. I had done my usual 5x100 warmup when they arrived. Bob invited me to swim with them. At first I rejected the offer. I did a 500 while they warmed up. then I could see they were getting ready to go so I figured what the heck, might as well join in. Victoria told me that they were going to do two sets of 4x200 in 3:30. Right. Whatever. I have no idea of what that meant in terms of pace, but why not. So Bob starts and for the first length I am right there with nice big strokes. Then he gets a jump outta the first turn. I hang with him but I am working hard. He must have finished in 3:00 and I was like 3:05, 3:10. Then Bang off again. This time I finish in like 3:15. Then bang off again. I am dying. I barely keep Victoria from passing me (and I had 15 seconds head start. 3:20. They are like OK go with Victoria on the last one but keep up with her. I go, but she blows me outta the water. So then they are like, "are you blown up?" Duh! Victoria looked concerned. "How about 150's?" she asked. Never! Actually I had to punch out because luckily I had plans to meet my buddy Denton for lunch. And at that point I had 1850 meters in around 40 minutes - so I was done. But the bad news is that I think I will try to hook up with them regularly on Tuesdays and Thursdays so that they can pummel me into oblivion at the pool. Sheesh! So thats the report. I have been recruited to train with two maniacal swimmers and finally I seem able to run! December 31 - 33 Miles Bike (MPH Ave 16.5, 38.9 Max; CAD Ave 75) 2 hours - Lucas Ride with Terry and Jane - Strong West Wind. So far this week, I have logged more running miles than November and December combined. I have been using a knee brace - which seems to help. I am looking forward to extending this trend! Today I hit the Treadmill again - a bit faster this time. I did about 3.3 miles in 30 minutes. Then I hopped on the LeMond Trainer and did 8.1 miles on the bike in 30 minutes. Who wants to see what a budding Triathlete-Cyclist looks like? Yup. That's me around 1966 or so on that swell red Kent. My only regret is that I would have been able to keep the training wheels. True Story - I had that Kent until one day when I was out with my brother and the kid next door, Baxter. The three of us were doing Kamikaze runs at each other on the baseball diamond. Me and Baxter had a full speed head on collision where I blew out the front tire. My dad, pictured above, decided that it was time to replace the Kent and I guess that must have been about four years after I had bought the Kent. He bought me a Dunelt three speed and he told me that, "I should be able to keep that bike until I was grown up." Or something like that. Anyway, I rode that Dunelt Bicycle down the C&O Canal Towpath when I was 14 or so. And that bike is STILL hanging up in my garage since I am not sure I have achieved the "grown up" status that my dad was referring to when he gave me the bike! I did not run at all during December in hopes that the knee would continue to improve. Yesterday I did 30 minutes on the hamster wheel at the gym. The knee was good for 28 minutes but was giving me grief the last two minutes. It was not a surprise that today my quads were a bit sore! Hey that's a good thing. But the knee was a bit achy too. Not so good. Today I hit the pool for the first time in two weeks week and knocked out 2500 meters (5x100, 500, 400, 300, 200, 100, 500) in about 55 minutes. I am determined to ignore whatever has upset my knee and continue running. I will say this about the stupid knee - I have gained back most of the range of motion that I had lost. And I am taking that as a positive sign. Three Funerals and a Wedding. There was no wedding, but I thought the title sounded better with a wedding. For the third time in a year and a half I had to fly to Baltimore for a funeral. In May of 05 my cousin Ozzie died. Then in August my buddy David died. Then on Christmas Eve I got word that Ozzie's brother George had passed. Lemme just say that this is getting old and hopefully that the 'bad things happen in threes' thing is true and I can start flying to Baltimore for more enjoyable purposes like seeing the Orioles beating the crap outta the Yankees! Anyway, this time I had the kids draw straws and Reagan lost so she had to accompany me on the trip. We grabbed the last flight out on Thursday arriving at BWI past midnight. We parked it at the same Red Roof that I stayed at for David's Funeral. Reagan and I got up at 0700 and picked up a Ford Taurus and then headed to the Church for the 10:00 mass. After the Mass and Internment services all of us headed to a local eatery for a late lunch. Besides Reagan and I, there was a mess of family: My Dad and Stepmom, and my Brother. There was also a mess of Cousins: Allan and his wife (brother of George and Ozzie); Liz wife of Ozzie; and Jim, Daniel, and Robb Sons of Liz and Ozzie. In spite of the circumstances, we all had a great time getting back in touch. After lunch Reagan and I headed down towards DC to see my Mom. That night we took the Metro to downtown Silver Spring and Reagan of all people suggested that we go to the Thai restaurant. We spent the night with my Mom and the next morning Reagan and I high tailed it up to Mt Airy, Maryland where we paid a visit to a couple who I went to High School with. That visit was pretty short although Mark let me ride his Duc which was fun. Then it was back to BWI and home. Reagan was an excellent traveling companion. No more funerals please. Particularly in Baltimore. Update: Feb 26 - Added link to photo of me riding Mark's Bike.